Great bold taste. Naturally sourced stevia extract. High in vitamin C. Free from artificial colours and preservatives.Enjoy the taste of our Blueberry juice drink: smooth and deliciously refreshing and its Vitamin C helps maintain a healthy immune system.? 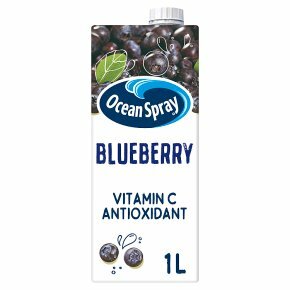 ?The 32mg of Vitamin C in 100ml of Blueberry juice drink per day contributes to the normal function of the immune system as well as contributing to the reduction of tiredness and fatigue and to the protection of cells against oxidative stress as part of a varied & balanced diet and healthy lifestyle. 50% Less Sugar?? ? ?Than Original formula.